Donate to protect one of the most endangered & important habitats in Ontario: Wetlands. Despite the crucial role they play in providing natural habitat and maintaining the health of our lakes and rivers, they are disappearing at a rate of 80 acres a day. Protecting such vanishing wilderness is a high priority for The Couchiching Conservancy, and when the opportunity to create the Thomas C. Agnew Nature Reserve arose, we acted. Thomas Agnew was an early settler and businessman in the Washago area. His descendents developed a growing love for the landscape. In 2011, his grand-daughters, Joan Berndt and Susan Campbell, generously arranged a part-donation /part-sale of an 85-acre property to The Couchiching Conservancy. 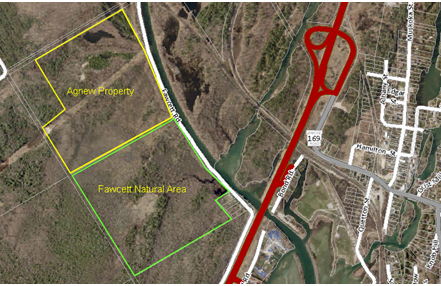 The property is adjacent to the Robert and Emily Fawcett Natural Area and the two properties contain the same precious wetland complex, teeming with wildlife. The new Agnew Reserve also contains a mixed upland forest which is a groundwater source for the large wetland. As the attached project outline shows, we have been successful over the past few months in securing a portion of the project costs, but in order to properly protect the new reserve critical funding of over $40,000 must come from private donors. I hope you will choose to be part of this important project by immediately making a donation, or by pledging funds that we can collect in October. Cheques can be made out to The Couchiching Conservancy – Agnew Reserve, and mailed to Box 704, Orillia, Ontario, L3V 6K7. If you prefer, you can also pay by VISA by calling 705-326-1620 or by using our online donation service through Canada Helps on our website www.couchichingconserv.ca. Charitable receipts are issued for all donations over $20. This entry was posted on August 30, 2012 at 11:40 am, filed under Uncategorized. Bookmark the permalink. « Ruby-throated hummingbirds: tiny energy!